Erin Rose, located at 811 Conti Street, is what I would consider, the perfect bar. No it isn’t 5,000 square feet with wall to wall televisions, and sorry, there aren’t any game tables either. In fact it’s pretty small, and has only two rooms to it. But what they do have more than makes up for what they don’t. Some might call it a dive bar, but I’d call it a neighborhood bar, full of plenty of history with wall to wall photos, memorabilia, and signage. 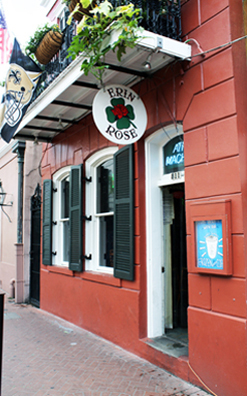 An Irish bar by theme, Erin Rose is tucked away in the French Quarter, only a few short steps from the night life of Bourbon street, close enough to the action yet hidden enough for the locals to enjoy a good game and conversation. . They’re a lot like one of New Orleans most famous dishes, Gumbo. The crowd is a mix of tourists, locals, and bartenders from other bars around town. Just look at their motto: Local Chaos, Local Prices. Local Love. That pretty much sums it up perfectly. They might not be on bourbon, but at any given time it gets wild and you might even catch a patron (or staff member) dancing on the bar belligerently. Not looking to spend too much? The prices are as local as it gets. The drinks are generous, and for what you would expect to spend at home, not on vacation. They’re pretty well known for their bloody Mary’s and frozen Irish coffees. So even we couldn’t resist stopping by for a 2am frozen treat. It was literally the best frozen coffee we’ve ever had. And to satisfy our touristy needs, it comes in an awesome Erin Rose plastic cup. Next time you’re in Nola, don’t miss out on this one. For more updates on the latest brand launches, cocktail recipes, and industry news, make sure to Like Us On Facebook, or Follow us On Twitter.